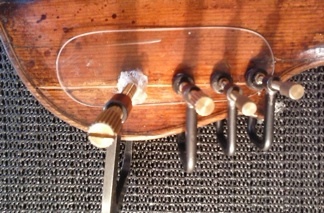 During the workshop experience, I worked on a violin set up. After assessing the instrument I made a new fingerboard and top nut, then I made a new soundpost and a new bridge. Jonathan followed me in the whole process and we discussed how to approach the instrument, what needed to be done in order to improve the set up. In a set up nothing can be taken for granted, every component being in the right place carrying out their function, everything works as a whole. 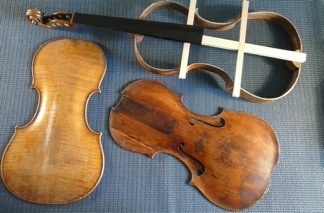 The photographs show a recent violin by Alberto based on an Antonio Gragnani of 1780. It was very interesting to visit the auctions and to learn about recognition of instruments. I had the chance to look at and to study several fine violins and cellos and with the guide of Geoff I learnt about details typical of the makers and characteristics of the construction methods. It was useful to closely look at a few violins (dated from 1700 to 1760) of the Gagliano family, checking for the similarities between them. Focusing on instruments of the same origin helped in order to use a comparative method in spotting the similarities. Walking down Queen Anne Street, I tried to keep my emotions down because I did not know what to expect. Just five minutes later all the tension was gone, I was drinking an espresso and chatting in Italian with Andrea Ortona. Andrea asked me the question everybody asks me. Why I chose a school in England rather than in Italy. The answer is quite simple. In the first place, this was advised as the best choice. Secondly, it is one of the few places where violin restoration is taught in a proper way and it is possible to be in contact with the major restorers. The reason why I was at Beare’s talking with one of them. The visit began with showing me the workshops and introducing me to Peter Gibson and Gordon Kerr. 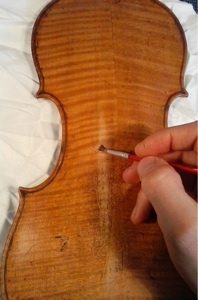 I brought with me a restoration project violin I am working on and asked them if they would have liked having a look. 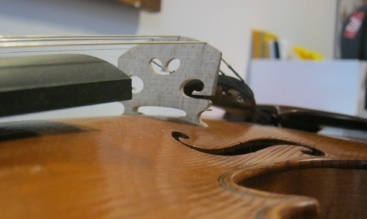 As every violin maker does as soon as there is a new fiddle going around the workshop they were really happy to look at the instrument and the detective game of recognition had started. They all eventually agreed it could possibly be an English violin from 1850’s. I was given important advice on how carrying out the crack repair on the back and correcting the arching. Andrea reassured me on the feasibility of the project and told me that, after all, if I am able to take this entire project to the end, I will be a restorer, just at the beginning, but a restorer. Soon after I was handed a 1720 Stradivari violin and I could see in real life what I am trying to copy in school just from a two-dimensional drawing. I was feeling thrilled by the object I was holding, being able to see details and shapes difficult to grasp from a picture. Also, I felt a bit frustrated by my own work. 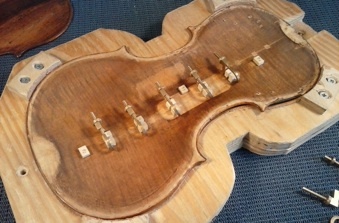 Gordon showed me the job he was starting, making a neck graft on a Storioni violin. Andrea talked a bit about the material he uses in casting the edgework, something completely new to me. I took notes on the procedure and where to get the compound from. Furthermore, he advised me on cleaning the instrument and the cracks, recommending the use of the simplest product, water for instance, and only if necessary moving on to other cleaning agents. Knowing it was working time and not wanting pestering them with my student questions, I thanked them and said goodbye. Without knowing, they just gave me an unrivalled boost in my training and I would like to express my greatest gratitude to them all. I would like to thank all the master craftsmen and craftswomen at Beare’s, Samantha for dealing with my emails and organising the visit and a special thanks to the RAB Trust that offered me this opportunity.